Let it infuse for a couple of hours in the fridge or at room temperature. 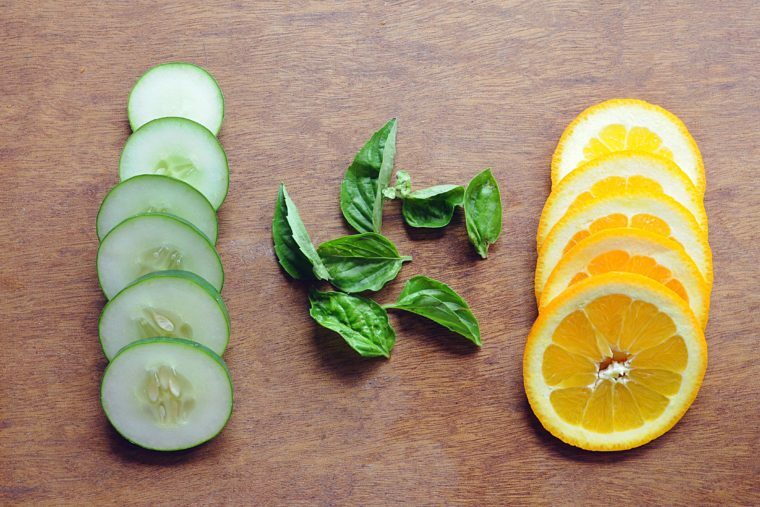 This is a colorful and refreshing drink but it is also healthy. 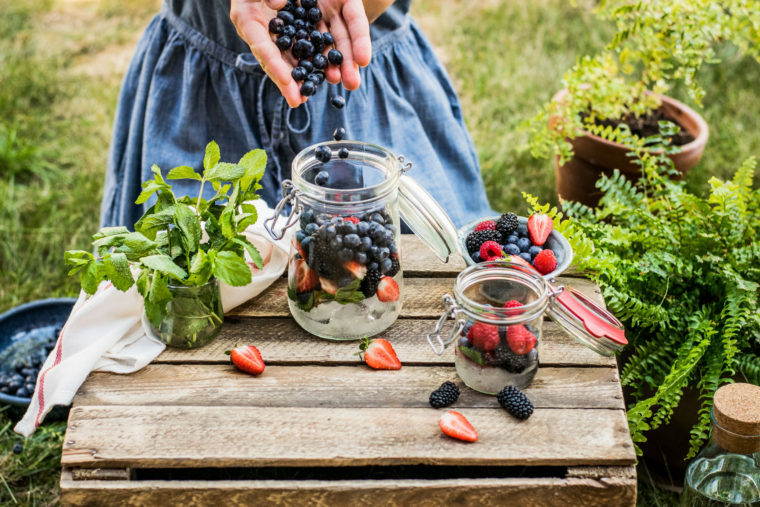 Strawberries are packed with antioxidants and vitamin C; lemon offers similar benefits plus it has antibiotic and anti-carcinogenic properties; and mint helps your digestive system. Fun fact – by using mint in your infused water recipes you are following in the footsteps of the ancient Greeks and Romans. They also used mint to flavor their water. 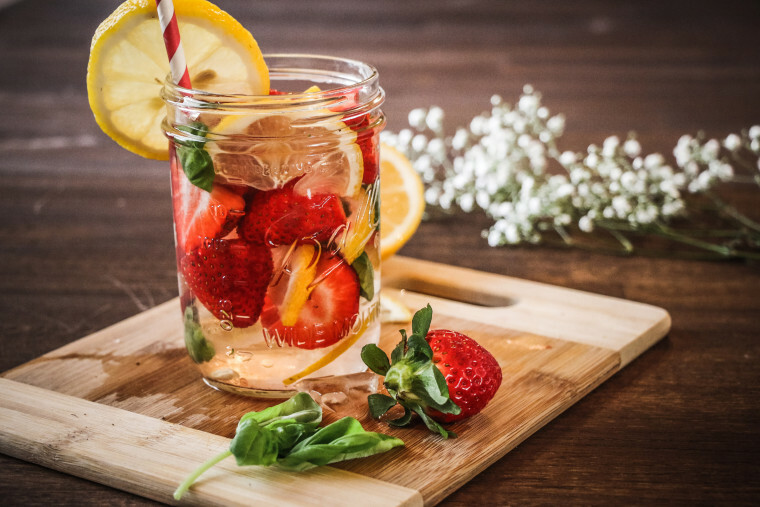 This infused water recipe is a fusion of flavors that taste as good as they look – sweet strawberries & raspberries, sour lemon, and mint. Mushing the ingredients up a bit adds even more flavors. We all know we have to drink the right amount of water every day to stay properly hydrated, but when are the best times to drink water? There are some key times of the day that you should have a glass of water. Those times are related to activities during the day, such as exercise or eating. Getting these timings right is important but your main objective (in addition to drinking enough water every day) is spreading out your consumption over the whole day. Taking regular glasses of water over the course of your day is the best way to stay hydrated. 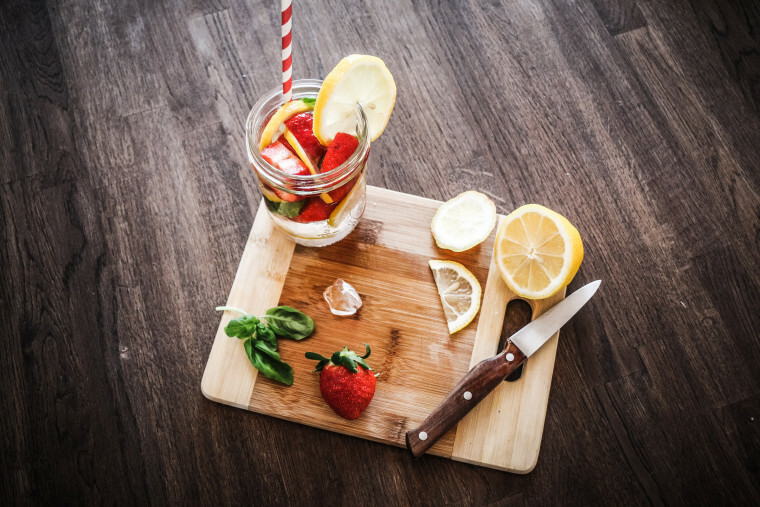 When you wake up – your body uses water while you sleep so this replenishes your system. It also helps your body remove toxins. Before meals and snacks – you should have a glass of water about 30 minutes before you eat. This helps you to eat less and it helps your digestive system. 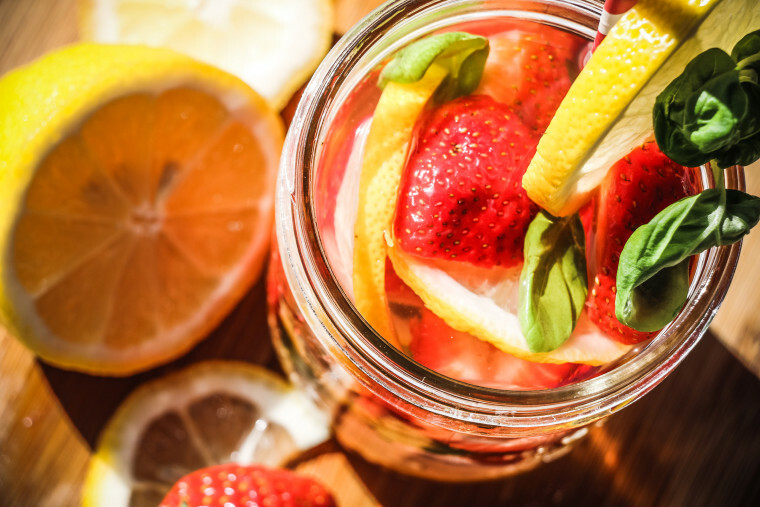 Add taste – if you struggle with the taste of water you should try infusing it with fruit to give it a more interesting taste. This will motivate you to keep you coming back for more. 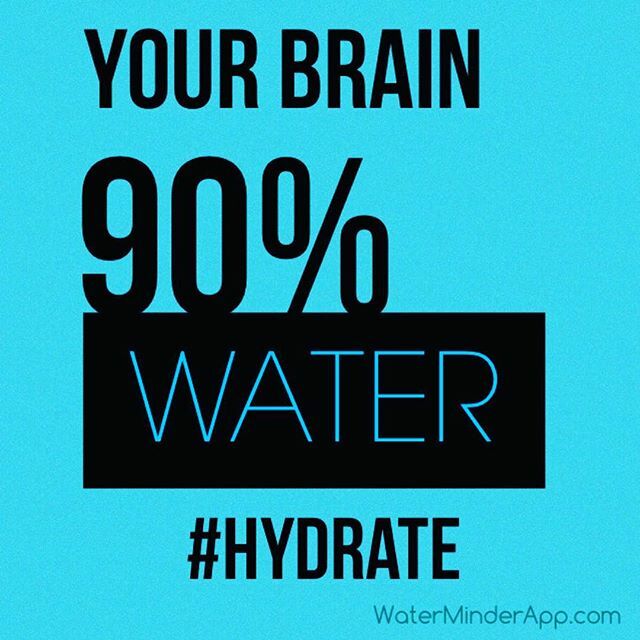 Get reminders – use WaterMinder app to track your water intake and give you reminders to drink throughout the day. 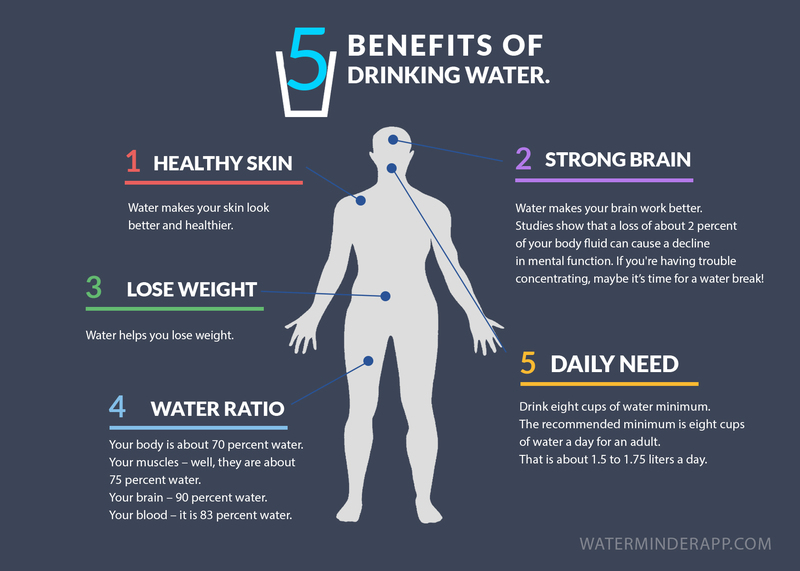 Drinking water should become a natural and regular part of your daily routine. This will help your hydration and keep you healthy. Adding lemon or mint to water is fairly traditional. 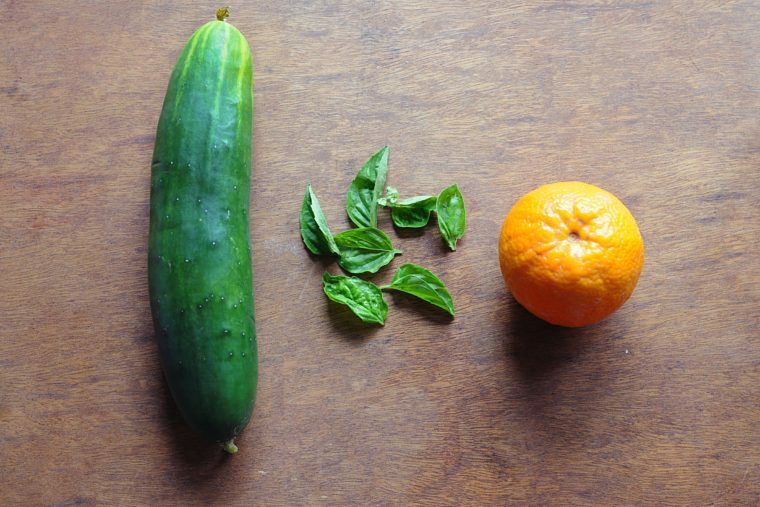 Even oranges feel normal, but cucumber? 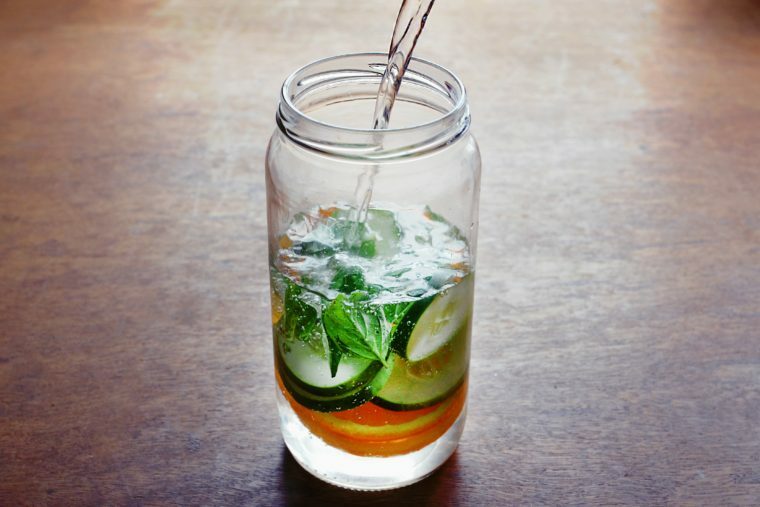 The fact is the fantastic cucumber brings a number of health benefits to this drink including anti-inflammatory properties. It is also a good source of vitamins and minerals, such as vitamin K.
Fun fact: the term “cool as a cucumber” comes from the fact that cucumber can cool the temperature of blood. That’s why it is used in beauty routines. This is a powerfully detoxifying drink, but it is also wonderfully refreshing. The citrus flavor of oranges and lemon mix well with the other ingredients: the subtle taste of cucumber and the gentle kick of mint. 2. 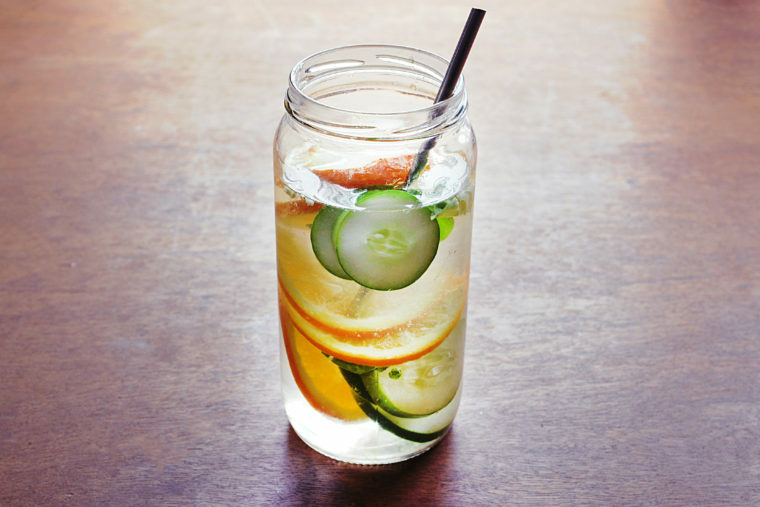 Put the oranges, lemon and cucumber into a pitcher of water. Gently mash with a spoon to release more flavors. How much water should you drink every day? What type of drinks should you consume to stay hydrated and what drinks are harmful or unnecessary? When should you drink? These are just some of the questions that are often asked about hydration. Unfortunately some of the answers to these questions are simply wrong. 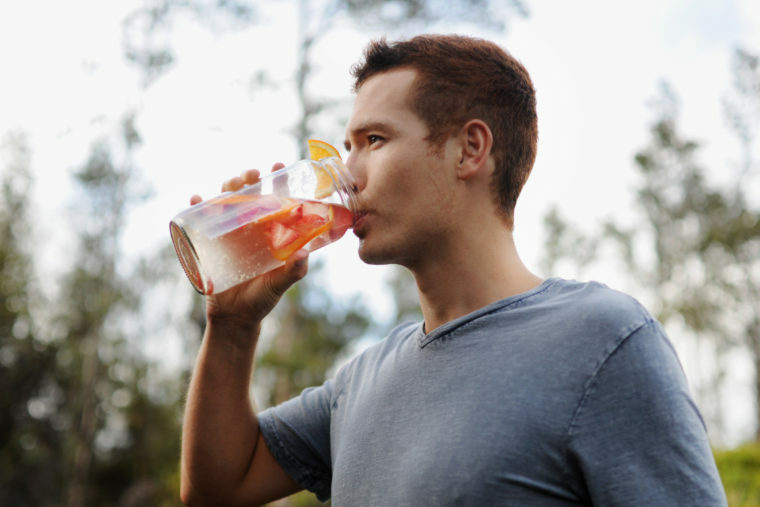 Here are four common hydration myths debunked. There is no way to determine a general figure for the amount of water that we should drink each day. Just think about how different we all are. We are different sizes and weights. Some people are athletes, while others will live in dry or hot climates. All of these things impact on the amount of water that you need to drink every day to stay hydrated. The fact is that for many people eight glasses of water a day is not close to being enough. You need to look at your own lifestyle and needs – and you need to look at the color of your urine. It is still the best indicator of how hydrated you are. Ideally, it should be a pale lemonade color. If it’s not, you will need to increase your daily water intake. It doesn’t matter how hard you train, water is probably the best option post-exercise. The exception is if you are doing an endurance event so are training for longer than an hour. When this happens your body will need to replace the electrolytes that you lose during exercise, which sports drinks contain. For most people, however, water is better. You probably don’t need the electrolyte replacements, and by drinking water you will avoid the sugar and additives that are found in most sports drinks. If you have forgotten to drink regularly throughout the day you can’t catch up by drinking a large amount of water in one go. Your body doesn’t work like that – it will simply pass on through. The best approach is to drink frequently and at regular intervals throughout the day. 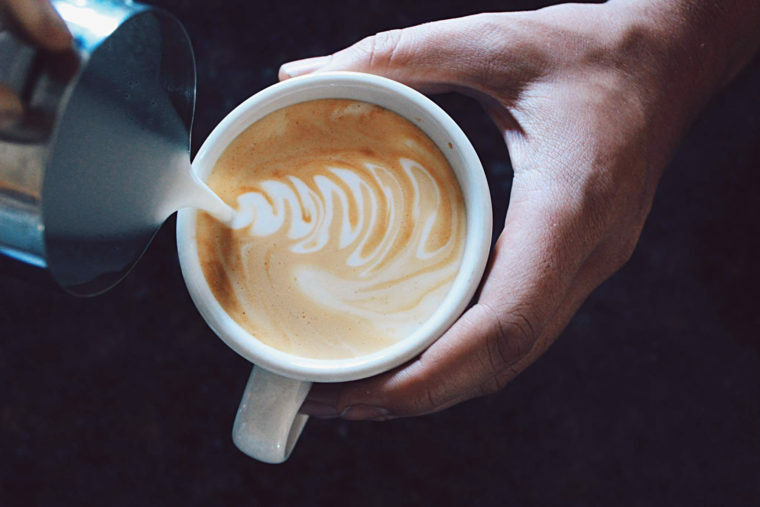 This is possible as caffeine does dehydrate, but not when you drink coffee in moderation. Therefore it is not the coffee that you drink that dehydrates, but the quantity of coffee. So, how much is too much? Most people can drink about two cups of coffee a day and not see any dehydration effects. One fact that is not in dispute is that you need to drink regular cups of water every day to stay hydrated. At least we know that one is true. 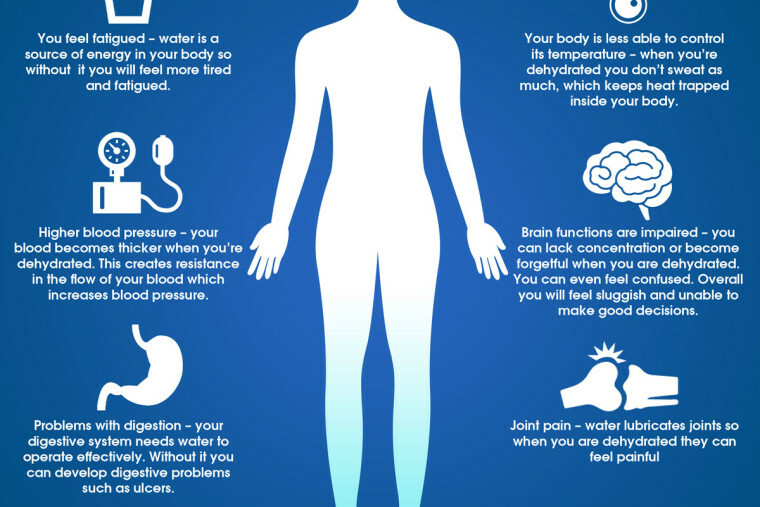 7 Things That Happen To Your Body When You’re Dehydrated? Hydration is all about balance as your body needs water for a number of different bodily functions. This includes everything from lubricating joints to helping your digestive system to keeping your skin healthy. What happens when you’re dehydrated, though? Here are seven things that dehydration does to your body. You feel fatigued – water is a source of energy in your body so without it you will feel more tired and fatigued. Higher blood pressure – your blood becomes thicker when you’re dehydrated. This creates resistance in the flow of your blood which increases blood pressure. Problems with digestion – your digestive system needs water to operate effectively. Without it you can develop digestive problems such as ulcers. Your body is less able to control its temperature – when you’re dehydrated you don’t sweat as much, which keeps heat trapped inside your body. Brain functions are impaired – you can lack concentration or become forgetful when you are dehydrated. You can even feel confused. Overall you will feel sluggish and unable to make good decisions. The best way to avoid dehydration is to drink regularly throughout the day so that your body remains in balance. It is important that you know and recognize the symptoms of dehydration, though. One way you can test for moderate and severe hydration is by doing a skin turgor test. It involves pinching the skin on the back of your hand. If the skin returns slowly to its normal state you are probably dehydrated. Slowly means it takes longer than a couple of seconds. 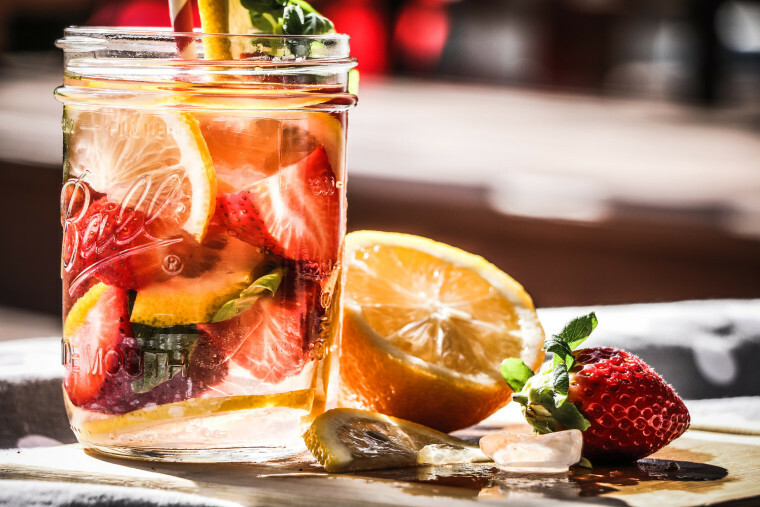 Dehydration can have short term and long term impacts on health, so the best advice is to maintain the water balance in your body and stay hydrated. 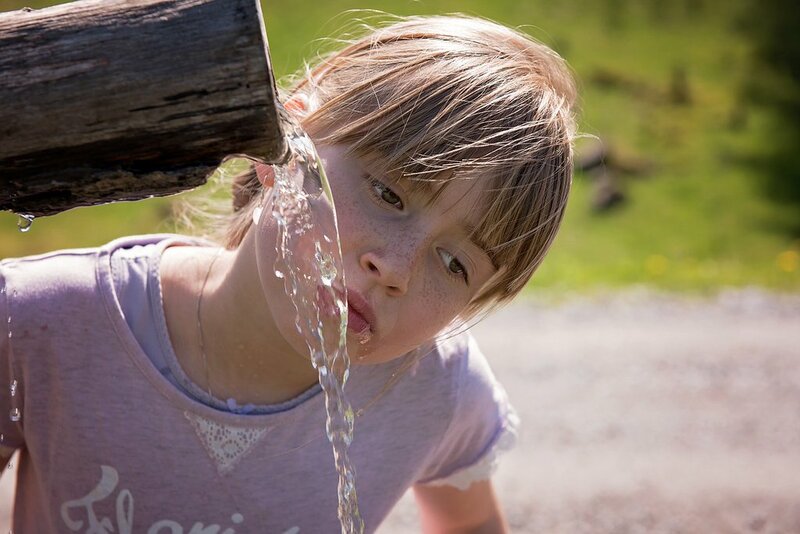 33% of children find it hard to remember to drink water without reminders. Please remind your loved ones to stay hydrated this spring! Strawberries are probably the most popular of all the berry fruits. They are a great source of vitamin C and K. Strawberries also contain fibre, folic acid, manganese and potassium. They are good for the skin and for your digestive system. Fun fact – strawberries are not technically fruits because their seeds are on the outside. They are part of the rose family. 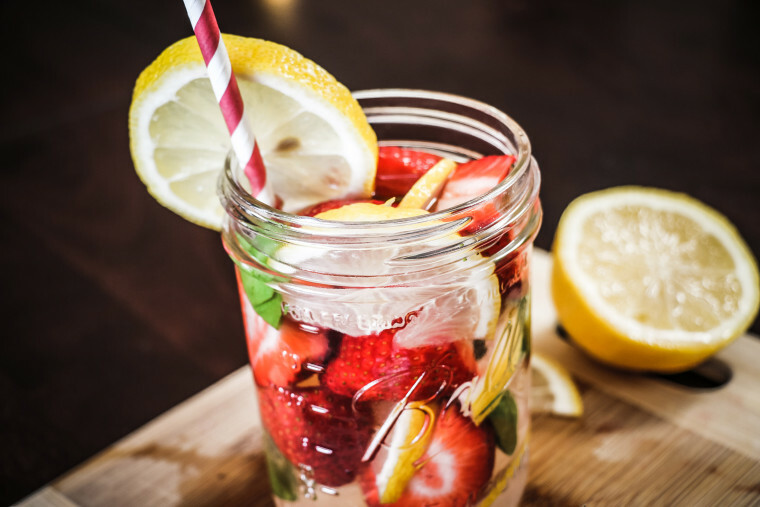 Put the strawberries and lemon into a large pitcher. Add ice.